One of the occasional questions we receive is how to remove tire marks or tire stains from epoxy coated floors. This is usually followed up by a second question of why does this happen. After all, it can be a bit frustrating to put down a nice coating to discover that your car is starting to leave ugly black tire prints – usually right where you park every day. So let’s take a look at what causes this to happen and what can be done to remove those offensive tire marks. The process that causes tires to leave black marks on your epoxy floor or any other type of floor covering for that matter is called “plasticizer migration”. Plasticizers, which are a combination of polymer compounds, are used in the tire industry to create a more flexible rubber compound. This flexible compound will give a tire more traction and help to keep it soft and pliable in cold weather. When a tire heats up from driving, these plasticizers tend to relax and leach out of the tire leaving these oily marks on the epoxy coating. It is more noticeable with high performance tires and good quality all-season tires. This is why some people comment that one car in the garage has a tendency to leave these marks or tire stains and another car will not. If a car tends to sit for long periods of time in one spot, this same plasticizer migration can occur, but at a much slower pace. 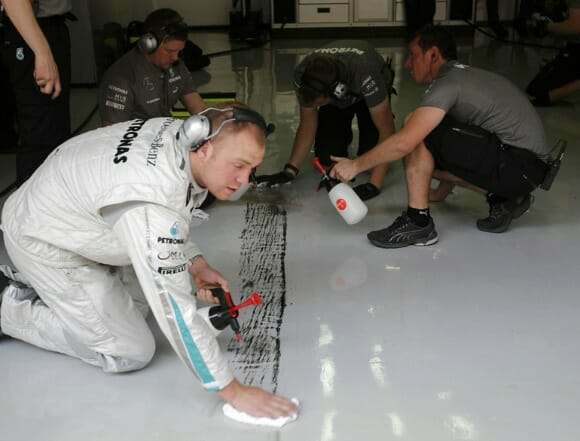 So how easy is it to remove tire marks from your garage floor? Well, it depends on the quality of your epoxy floor coating and how long the marks have been left there before attempting to remove them. When a sealer such as epoxy cures, it creates a cross linking pattern that gives the sealer strength as well as density. The greater the cross linking, the stronger and more dense the sealer will be. This is why your commercial quality epoxies, polyurethanes, and polyureas are much easier to clean tire marks from than the lesser quality products. The high density of cross linking does a better job of preventing the plasticizers from penetrating into the sealer which can make it harder to remove. Generally, the easiest way to remove these marks is to soak the area for a few minutes first with a good cleaner such as Simple Green or a concrete degreaser. After it has soaked, use a semi stiff bristle brush to remove the tire marks. Be careful if using a scrub pad as these will sometimes degloss the finish. It may take a bit of scrubbing and a second soaking to remove it all depending on how long you have let the marks build up. Another product that people have had success with is Goof Off. You can usually find it at your local home improvement centers or auto parts stores. Every once in a while someone will have tire marks that just don’t want to come up due to a long period of buildup that has allowed the plasticizers to migrate further into the coating. Inferior epoxy can be the blame as well. When this happens there are some commercial products that are designed just for this. An example of one such product would be NAB Black Streak and Tire Mark Remover. It’s produced by North American Bioindustries and is available in a sample size to try out, as well as a 32oz. size containers. It has been used successfully to remove stubborn tire marks on factory floors for years. If you have a car that is leaving tire marks on your epoxy garage floor, the best thing you can do to prevent any permanent tire stains is to not let the marks build up over a period of time to begin with. Routinely cleaning your garage floor coating is great preventative maintenance that helps to prevent these issues. Also, if you have a car that sits for long periods of time, you may want to park each tire over a small scrap of cardboard, carpet, or any other material that you can discard. I like how you said, “Another product that people have had success with is Goof Off”. I’m going to get some of that stuff for my floor. I bet it would help remove the gunk that’s stuck there. Furthermore, it should make the surface shine nicely. What other products do you like? Vinegar and water also work well for general cleaning of the floor. There is a possibility of the coating loosing gloss if anything less than a high performance, commercial quality coating was used. The key is to use it sparingly and quickly so it does not linger on the surface. The dulling effect is just cosmetic and will not damage the coating. Sorry Bill, but we are not aware of a company that will clean tire marks. I used Goof Off. It will not dissolve anything but will get under it and allow it to lift off, thanks. Great, we are glad it worked for you Cecil! Will this staining eventually wear off as the tire gets older or will it just be a permanent issue? Thank you for your wonderful information. Michelin couldn’t explain anything. They acted like they never heard of this. If you are referring to the tire creating less staining as it gets older Jim, we really can’t answer that definitively. What we do know is that tire technology has come a long way and tires no longer tend to dry out and crack as they used to when they got older. Part of this reason is due to the plasticizer technology. More than likely, plasticizers will be leached from certain tires for quite a while. It doesn’t surprise us that Michelin couldn’t really explain anything. The staining problem was diagnosed by floor coating chemists after some research and talks with tire engineers. What we can tell you is that the higher quality polyurethane and polyurea top coats do a real good job of resisting tire staining. Ugh. Tire marks fit on a garage floor. Leave them they add character and affect nothing. lol.. That’s how some people feel Greg. Everyone has their own interpretation of what a garage should be. Once cleaned is there a polyurethane or some other sealer that would slow down tire marks and make it easier to clean in the future? I think I have a cheap epoxy painted garage floor. Just the water that drops off the front end after coming in from it raining outside will leave a brown stain. I can get it up but it takes a lot of scrubbing. Luckily it doesn’t rain all that often. Yes, you can use a clear polyurethane or polyurea top coat Shawn, providing that your floor is an actual epoxy coating and not paint or a 1-part epoxy paint. Because these types of top coats have some solvents, they would soften paint. It would require roughing up the surface with 100 grit sandpaper and wiping it down with denatured alcohol before applying the top coat. Our floor has a brown tint to it where the cars are parked. I tried Simple Green and it cleaned it but didn’t take away the tint of brown. Will anything? Hello Sam. That brown tint is from the plasticizers that leach out of the tires when they are hot. It can migrate into the subsurface of worn coating and lower quality coatings. It can be real hard to remove without sanding it out and applying another color coat or clear coat depending on what you have. We recommend givingGoofOff a try as it has been successful for some people. I purchased a Clark ma50 to clean my floor what detergent/soap/ solvent do you recommend? They suggest a non foaming detergent. Hello Kent. There are a variety of detergents that you can use with this type of machine. We suggest contacting Clarke to determine the best soap to use for your cleaning project. I applied Rust-Oleum EpoxyShield Gray Gloss 2-part. I have front tires leaving marks, I used fast orange and scrubbed with rough cloth. They come up, what should I do to get them off and prevent in future? We recommend applying a high performance polyurethane or polyurea clear top coat Tate. They will resist tire marks much better. The Rust-Oleum EpoxyShield is more of an entry level epoxy coating that can be susceptible to tire marks. Rainwater that evaporated off the clearcoat dried and left white spots on the floor. Standard cleaners won’t remove them. Any idea what might work? Hello Jim. We have an article about cleaning floor coatings here. You may want to try ammonia and water. If that doesn’t do it, a mild solution of vinegar and water will usually do it. Just don’t let the solution dwell for too long as vinegar is acidic and it may dull the finish depending on the type of coating you have. An off-topic question but I cannot find the answer anywhere else on the internet. I applied two coats of an oil-based, alkyd gloss enamel paint (Armor Coat Porch & Floor paint) over my garage floor (which I am converting to an office) and after two days the paint is still tacky in the locations where there were tire marks (which I mostly removed with TSP and a stiff bristle brush before painting). What chemical reaction has occurred and can you think of any easy solutions? Thank you! Hello Jacob. It’s the plasticizers that leach out of tires and cause staining. I found the TDS for the paint, but nothing catches our attention as to why it would do this. The polymers in the polyurethane might react to the plasticizers, but it would affect adhesion more than anything else. This type of product does not chemically cure either. It drys just as paint does. Our recommendation would be to contact the manufacturer for more info. There is a number in the data sheet under the warranty information. Hi Shea, it appears that the solvent in the paint reacted with the tire plasticizers, preventing the paint from ever drying. I removed all the undried, tacky paint over the tread marks with mineral spirits, which did not affect the surrounding dried paint, primed, and repainted and it worked! The newly pained garage floor is fine now. Thanks so much for hosting this wonderful forum and patiently answering questions that often really help others. Fantastic, Jacob. We’re glad it worked out and thanks for the kudos! It’s why we are here.